Don’t be deceived by the tranquil appearance of the Bradford Vikings activity at the Orkney International Science Festival. This was taken before it started! Once the doors had opened we were constantly busy with over 600 visitors. It was a fantastic event, with enthusiastic people of all ages joining in with chocolate casting, poo dissecting, cord making and rubbish bin exploration. We also tried a new activity, carving soap into the shape of Viking oil lamps to illustrate why the Vikings used soapstone (steatite) and what it can tell us about their trade routes. 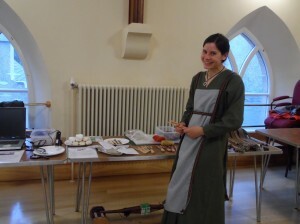 Jane Outram, a Viking reenactor from Shetland, impressed people with her amazing tablet weaving and her abilities to disentangle cords on lucets. We also had excellent help from Ms Rendall and children from St Andrews School in Orkney. On a slightly less hectic note, the results of the project were presented to an audience of 200 in a talk entitled ‘Dating Vikings’, also as part of the Science Festival. It was followed by a lively discussion and further talks on the Viking World by staff from Orkney College. The combination of events was an excellent way to draw to a conclusion the public engagement aspects of the project. Draft versions of all the activities developed during the project have been written and illustrated with action photographs from the various events of the last year. These will be available from the project website shortly. In the all too brief time remaining, there are a few loose ends to tie up. Some elusive publications and dates need to tracked down and added to the project database and all the information uploaded to the website. The academic publications are in progress and the next few weeks promise to be as busy as ever.